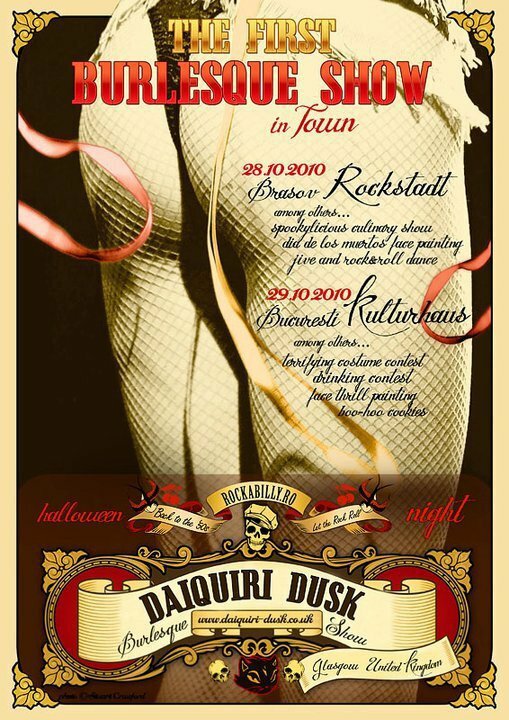 … just a few of the cities around the world, where award winning international performer Daiquiri Dusk has taken her unique brand of burlesque over the last decade! One of Scotland’s most recognised and longest-performing neo-burlesque stars, Daiquiri is famed for her tartan-clad performance on Britain’s Got Talent 2009, which established her as the original tartan tease. In 2010, she made modern-day burlesque history, when she was invited to headline at ‘The First Burlesque Show in Town’ in Brasov and Bucharest, the first time that international burlesque had been taken to Romania. She regularly appears at Glasgow cabaret clubs Riding Room and Wild Cabaret and has recently been part of the touring Sugar Revue, taking cabaret to Scotland’s rural venues. In addition to performing, Daiquiri teaches hen parties for the Academy of Burlesque & Cabaret and designs her own line of burlesque accessories, TwistedStarz Designs. She is also the founder of Scottish Burlesque & Cabaret: What’s On, which has provided a networking hub for performers, promoters and fans of cabaret and burlesque in Scotland since 2010.